Best Products, popularly known as “BEST,” is a defunct national discount catalog retailer who maintained a Bismarck showroom from 1979-1997. As of 1996, the company operated 169 showrooms and 3 distribution centers across 23 states, in addition to its catalog division. The company folded in 1997. The Bismarck showroom at 1026 E Bismarck Expressway opened in August 1979 under the LaBelle’s banner. It was the company’s second North Dakota showroom, after Fargo. The showroom itself accounted for roughly 1/3 of the 65,000-square-foot building. The remainder was warehouse space. At Christmas, a large portion of its warehouse was converted into a large toy department. Space was also set aside for a restaurant; however, none appears to have ever opened. Richmond, VA-based Best Products purchased LaBelle’s parent company, Minnesota-based Modern Merchandising, in 1982. 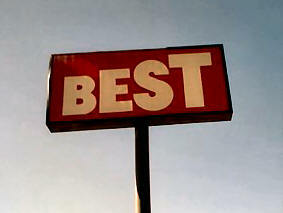 The local showroom was re-branded as “BEST” in July 1987, at which time the store underwent minor renovation. 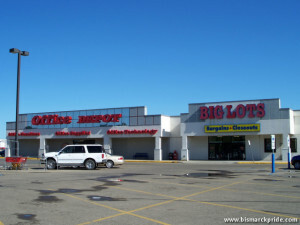 Today, the former Bismarck BEST store houses Office Depot and Big Lots, both of which occupied the building soon after BEST’s closure (in 1998 and 2001, respectively). Best Products was founded in 1957 and headquartered in Richmond, Virginia. At its height, BEST was one of the nation’s largest retailers, with locations in 23 states. However, much like fellow catalog retailer Montgomery Wards, BEST was unable to adapt to changing consumer trends, forcing its eventual closure. The company filed for bankruptcy protection twice, once in 1991 and again in 1996. In the months following its second bankruptcy, the company shuttered 81 of its 169 showrooms and 3 of its 4 distribution centers. At the time, North Dakota had two, in Bismarck and Grand Forks, both on the closing list. Fargo’s closed the year prior. The company folded in 1997. BEST – and its Labelle’s predecessor – operated as a traditional catalog mail-order retailer, later expanding its business model to include retail showrooms that blended traditional self-service and warehouse-style formats with its catalog division. Through its catalog and retail stores, BEST’s diverse product mix similar to a traditional discount department store. Among the few self-service departments – those purchased traditionally from a shelf – included toys, health and beauty, and sports. Most big-ticket items, such as electronics and furniture, were purchased through an order request, at which point the product was either retrieved onsite by store personnel from the warehouse or shipped through its catalog. Each Christmas, a large portion of its warehouse was converted into a toy superstore. The company was known for its expensive, unconventional store designs through a partnership with Sculpture in the Environment architecture firm. This trend excluded the Bismarck location, which portrayed a typical department store appearance. As I worked at both the Bismarck and Fargo locations in the late 80’s and early 90’s, I have a minor correction to your article. While Best Products purchased Modern Merchandising in 1982, it wasn’t until the summer of 1987 that the Bismarck Store #142 (and Fargo #141 and Grand Forks #143) showrooms were remodeled and the “Best” logo put in place. From a technical standpoint, it was at that time the new IBM Point of Order (POO) systems installed upgrading from the old MM “Maven” systems. Sadly it took until 1990, for the POS systems to be finally upgraded from ancient NCR 2151’s (programmed by cassette tape drive and requiring imprint credit card copies made instead of simple mag-stripe processing) to much nicer and faster NCR registers. Sadly the competition of the discount retailers without 1:1 customer service that finally took their toll. An interesting side-note, the Fargo store closed over a year earlier than the Bismarck and Grand Forks stores due to them losing their lease on the 13TH Ave S location they had held since 1976. The rumor was rent was more than tripling and Scheels was more than willing to pay that for the then prime location a decade before they finished their super store on 45TH St in Fargo. Thanks for the information – the article has been updated.